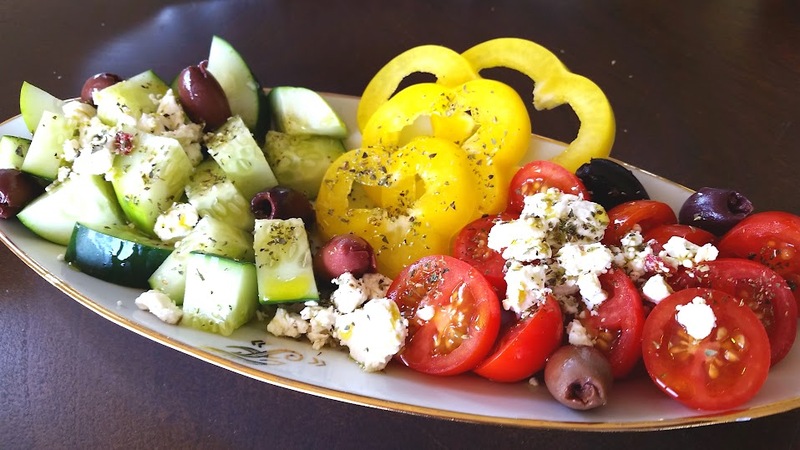 It’s really cold out today, so, naturally, I daydreamed about a salad eaten every day of our summers in Greece! First of all, I see restaurant versions of Greek salads all-the-time with lettuce, but there is definitely no lettuce in the traditional village salads in Greece! What there is plenty of instead is delicious tomato, cucumber and olive oil! This salad is so tasty, hands from all sides of the table reach into the salad bowl with pieces of crusty bread to sop up the remaining flavored olive oil. It’s not an easy feat, duplicating this in the US. If you’ve seen The Hundred-Foot Journey, then you’ll understand, “I found the vegetables have no soul.” That’s true of tomatoes and cucumbers. It’s also true of olive oil. When visiting Greece, my parents ship me local olive oil in 5 gallon containers, and I dispense this deep green beautiful truth in re-purposed wine bottles to every friend we visit. It’s totally different. It has smell, taste… depth of flavor. Ok, so find good Kalamata olive oil, and find good Kalamata olives. And find good feta. And find good oregano. Maybe go to an ethnic grocery store. Then, I don’t know what to say about the tomatoes and cucumbers. I’m not a gardener, so I can’t ask you to grow vegetables when I won’t. Maybe go to a farmer’s market. Gather everything up and then, you will enjoy a salad worth slapping a few hands out of the way to sop your crusty bread into. Chop up all your vegetables. Toss the tomatoes, cucumbers, olive oil, oregano in a mixing bowl. In a serving bowl, pour the vegetables, and add the bell pepper rings on top. Then sprinkle with olives, and with feta. And serve!